TriSmart Training Systems dedicates itself to providing the highest quality personalized endurance coaching for athletes of all levels. Head Coach Jennifer Meyer is a Level II USAT coach and a member of Team USA. She is a Level II Pose running instructor. 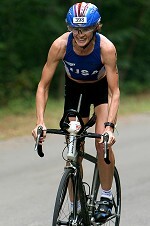 She finished in the top ten in her age group at the ITU World Championships in 2009 and 2006. She finished 3rd in her age group at the 2009 Age Group Nationals in Alabama. Jennifer has trained hundreds of athletes helping them reach their endurance goals. Jennifer specializes in refining and improving swimming, biking and running technique. Success. Coach Jennifer Meyer has been notified of your message.